Recently the University of Leiden has organised a study day on the Qur’anic text. The day was organised following the recent dating of the parchment of a Qur’anic manuscript via C14, that gave an astonishing result: the parchment dates between 650 and 715. The parchment, not the text. Anyway parchment was a quite expensive good, requiring a long process on the one hand, and an expensive raw material (the animals) on the other. For this reason it is quite improbable that the parchment was made and then used many years later. In some cases, the parchment was even re-used, as some palimpsests clearly show: the users washed out the first layer of writing and then write on the same parchment. Re-cycling something expensive to save some money. 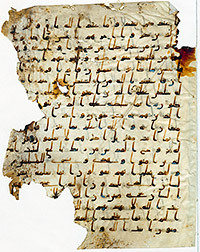 Early Qur’anic manuscripts were written usually in the script called Hijazi. A quite plain script, with some cursive traits. During the subsequent period, Qur’anic texts started to be written in the famous Kufic script, that underwent during centuries a decorative and embellishment process. But how did Arabic script start? What are its origins? How was it developed during times? Where and when was the script developed? And how the orality influenced that development? What was the tradition that was connected with the birth of the script? During the day speakers have stressed various aspects of the writing tradition, citing the Qur’an and pre-Islamic poetry in order to dig the ‘origins’ of such a tradition. But how and to what extent can these sources be used for understanding the development of the script? Most probably, to trace an evolution of the Arabic script we should primarily rely not on manuscripts, but on rock carvings. When and where the Arabic script was developed? 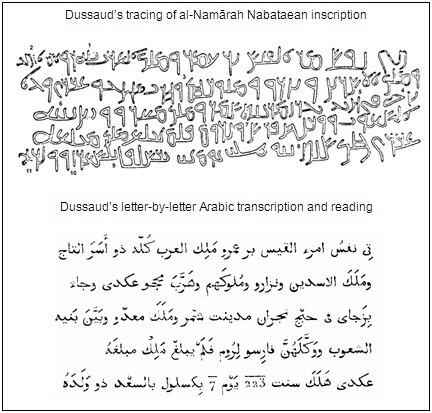 Laila Nehmé, archaeologist from the French National Centre of Scientific Research in Paris, traced an interesting development of the Arabic script, whose origin are to be found in late Nabatean script. In the last decade, a lot of Nabatean iscriptions were found around Arabian peninsula, particularly in the North-Western part. These discoveries have of course allowed further research over the general development of the script. These new studies will affect also our understanding of the development of the Arabic script, that originated from Nabatean one. Around the 4th and the 5th centuries a form of Nabatean script, labelled ‘Nabateo-Arabic’ developed in the North-West of the Arabian Peninsula: comparing the letters of this group of inscriptions and the Pre-Islamic Arabic inscriptions it is clear that the two groups are close in a sense . This brings to the consideration that probably sometimes between the 5th and the 6th century the standardization of Arabic script took place after having originated from the Nabatean, the questions are where and how? The first problem is of course a lack of documents (graffiti or inscriptions) dating from the 6th century: missing the link, it is difficult to say something certain about the script development. On the other hand, another problem would be given to the material of the documents available. It is commonly maintained indeed that script evolution does not (or better, cannot) occur on rock inscription/graffiti. There are two main reason for it. Firstly, in order to develop traits such as the ligatures, the writer needs a soft surface (a parchment) and possibly ink, or something similar. The soft surface would of course help the development of a ‘cursive’ script. The ligatures or similar ‘cursive’ traits will then subsequently used also in graffiti/inscriptions, when they are widely used on ‘soft’ documents: no one would ever imagine to use ligatures for the first time while carving a rock, don’t you think? 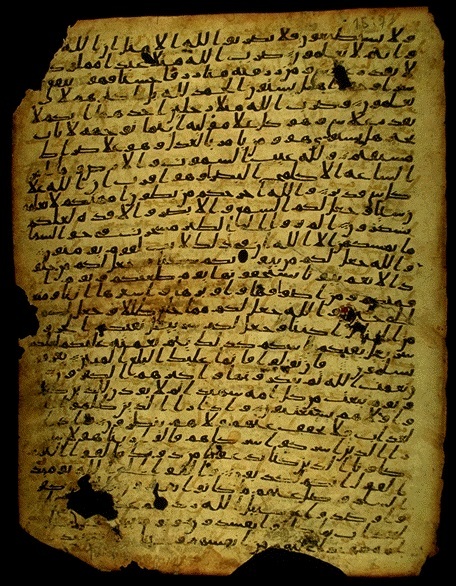 Hijazi palimpsest, San’a corpus ms. 01-27.1, UNESCO. It was thus necessary to have a group of people writing on soft material: something like a chancery. But not a traditional Nabatean one. Around 360-370 a great shift occurred in Arabia: there was an emergence of Arabic rulers that named themselves as kings. Did they have a chancery where scribes could write on soft parchment, thus developing the script? Or maybe the lack of a centralized power favoured an autonomous development of the script? A second aspect to be taken into consideration is of course the conservative nature of rock inscriptions: writing on a rock or on a solid surface was usually related to the central authority. When the Nabatean authority wanted to have something inscribed on a rock, usually the calligraphic Nabatean was used, and the script tended to develop slowly. Thus, what I wonder is: how much time did it take for the evolved script to appear on the rock? While Nabateo-Arabic was carved, how was people writing on soft material? And which idea of power and identity was comprise in the inscriptions in Nabatean, Nabateo-Arabic and Pre-Islamic Arabic? The script was actively perceived as an identity mark or was it simply a way to communicate? To what extent the writing tradition contrasted the oral one? How the oral identity of, say, pre-Islamic poetry differs from the written identity of pre-Islamic graffiti?